Hood’s Phlox (Phlox hoodii Richardson) is a highly variable, widespread species found in Western North America from Alaska to Northern Mexico on the west to Manitoba, Nebraska, and New Mexico on the East. 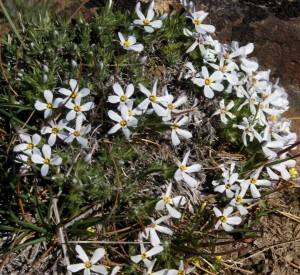 It is a common constituent of the sagebrush community, and is one of the first blooming plants in the spring after the snow melts. It is not found along the coasts. In Washington, it is found east of the Cascades. Phlox hoodii is also referred to as Carpet Phlox, Moss Phlox, and Spiny Phlox among other names. The morphology of this species is highly variable with several recognized varieties. I am not sure which variety this one is, but it is one of the mat forming ones growing from a deep tap root. There is at least one variety that is more erect. The leaves are sharp-pointed barely more than 1 cm long. 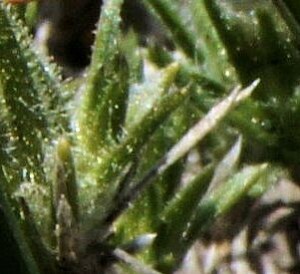 The herbage is hairy in texture, the hairs short to long, woolly to cobwebby. The inflorescence consists of a solitary flower in in shades of blue, pink, and white. 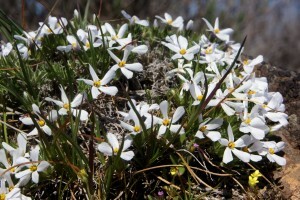 The throat of the flowers are about 1 centimeter long, and spread out to a flat five-lobed corolla. 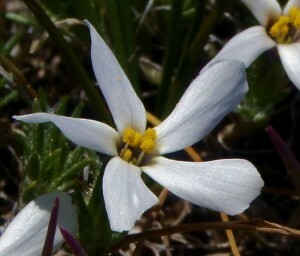 Sir John Richardson who first collected this species in present-day Saskatchewan, Canada named it after Lieutenant Robert Hood, a junior officer who accompanied Richardson on one of his expeditions. This entry was posted in Plant Profile, Sites around refuge, Trip to Spokane. Bookmark the permalink.